We are doing more iPad repairs and iPhone repairs than ever! News update: we are currently repairing more iPads and iPhones than ever before. More iPad repairs and iPhone’s repaired than ever before! We are currently repairing a range of faults mainly on iPhone’s and tablets, but don’t forget we are mainly a laptop and Apple Mac repair centre so we can still recover or wipe your hard drive and install windows. 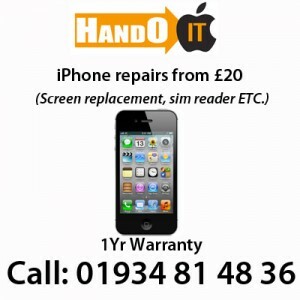 iPhone repairs in Weston super Mare. Don’t forget our iPhone and iPad repairs start from £20!, We wont be beaten on price or quality. We use the best quality parts available to us to get you phone or tablet back up and running as soon as possible. For more information or a free quotation give us a call.